Twins John and Paul Pascoe were born in Christchurch in 1908. On leaving school John joined his father’s legal firm and studied law, but failed to graduate. He also joined the Canterbury Mountaineering Club and was soon exploring little-known valleys and conquering unclimbed peaks. Pascoe began taking photographs as an aid for future route-finding, but he was soon writing stories about his experiences for local newspapers, illustrating them with his photographs. 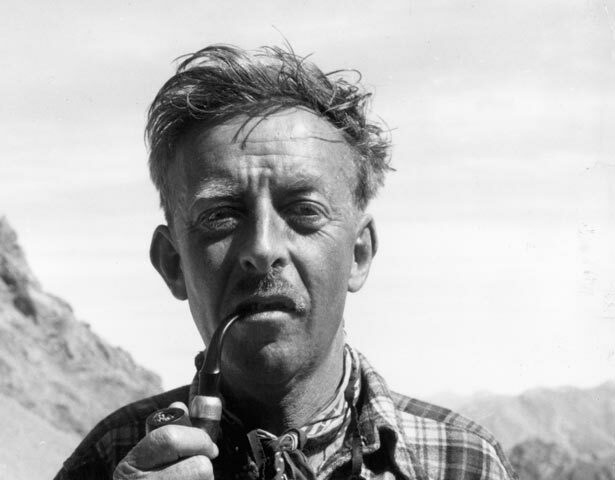 1939 saw the publication of Unclimbed New Zealand, which documented his mountain adventures. A couple of years earlier he had written to Joe Heenan, then under-secretary for the Department of Internal Affairs, and asked for a job. The job he got was illustrations editor for the 30-part centennial magazine Making New Zealand. At the end of that project Pascoe was appointed official war photographer, turning his camera towards the social experiences of wartime New Zealand. Although not a typical public servant, over the next couple of decades Pascoe undertook numerous roles including founding secretary of the National Historic Places Trust, controller of the Wildlife Branch, and chief archivist for the relatively newly formed National Archives (now Archives New Zealand). Throughout all this Pascoe continued to climb, never without his camera and notebook, and produced a stream of publications and magazine articles. He is said to have conquered over 100 peaks, 23 of which were previously unclimbed. Pascoe was still chief archivist when he died in Christchurch on 20 October 1972, an event overshadowed by the death, two days later, of poet James K. Baxter. We have 16 biographies, 7 articles, related to John Pascoe.